Expats perpetually suffer from “grass is greener” syndrome — those based in Siem Reap jealously keep tabs on the big city restaurant offerings found in Cambodia’s capital, but for this Phnom Penh expat, Siem Reap had more than enough to offer on a recent visit. Because of Siem Reap’s massive tourist traffic, the dining scene is positively international, offering excellent French, Korean, Japanese and Italian choices, in addition to tasty Cambodian fare. No matter what your preference or budget is, Siem Reap has something delicious for dinner. The best pizza pies in Siem Reap at Il Forno in the Old Market. Off of Pub Street, Il Forno is dishing up some of the best pizza in Cambodia. 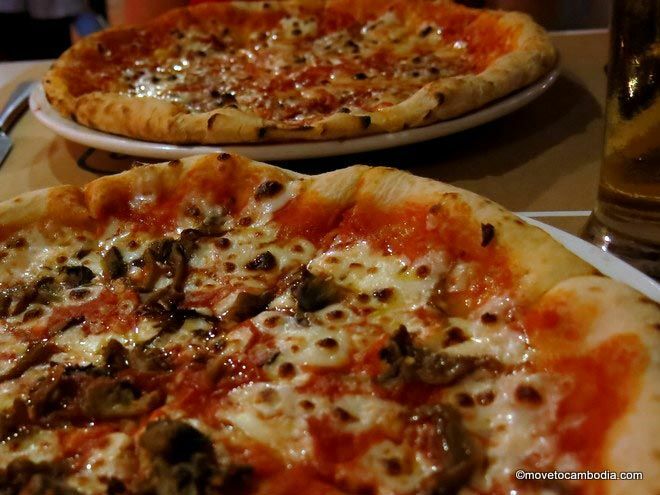 Their speciality are perfect thin-crust Neapolitan wood-fired pizzas, but their homemade pasta dishes are also wonderful. If you have a few people, try their seafood platter with tuna and sea bass carpaccio and prawns to share. Art or food? Make the decision yourself at Ababus in Siem Reap. Serving French and Asian fusion dishes, Abacus offer one of Siem Reap’s tastiest fine-dining experiences. 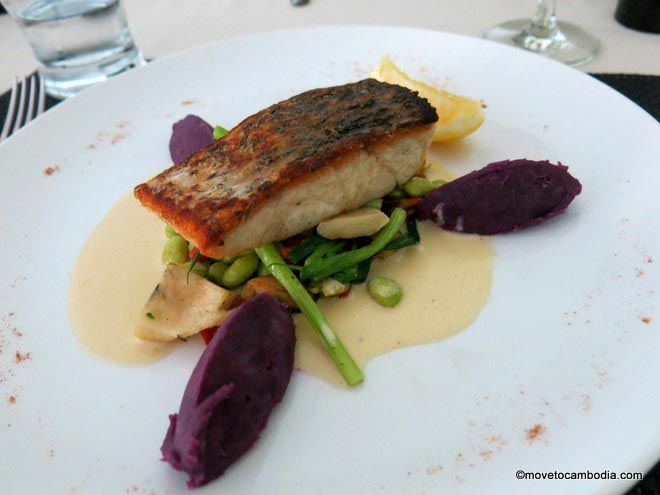 Those in the know rave about their lamb leg with olive sauce and the pan-fried beef tenderloin, but their seafood offerings are just as good–try the salmon on crabmeat bolognaise. Treat yourself to a feast at Siem Reap’s Cuisine Wat Damnak. Cuisine Wat Damnak is arguably the town’s best restaurant, with chef Joannès Rivière offering a modern interpretation of traditional Cambodian fare, in two delicious weekly set menus, with five courses for $19 and six courses for $26. Siem Reap’s large Korean and Japanese expat population means you can find better offerings of these cuisines in town. Far down airport road is Happy Restaurant, one of the best Korean restaurants I’ve tried in Cambodia; their spicy pork bone soup is sublime. Cheap and cheerful Dae Bak is closer to town and has a barbecued pork set meal for $5 that will leave even the most ravenous visitor sated. Japanese restaurant Basho has a homestyle Japanese menu plus a few maki offerings (but if you’re looking for sushi and sashimi, head to Takezono at Sokha Angkor Resort for what locals claim is the be town’s best). For authentic Khmer fare, try Bopha Leak Khluon Restaurant in Siem Reap. You’ll find the best Khmer food in town outside of the Old Market area, but still within walking distance. On Sivutha Boulevard there are many small Cambodian eateries. You can enjoy a delicious feast at Chanrea Dom Makara for just a few bucks per person. Try the prahok ktih, where the flavours of the pungent fish are tempered by rich coconut milk and fatty minced pork. Served with raw vegetables and tiny, bitter eggplants, this is prahok worth tasting. 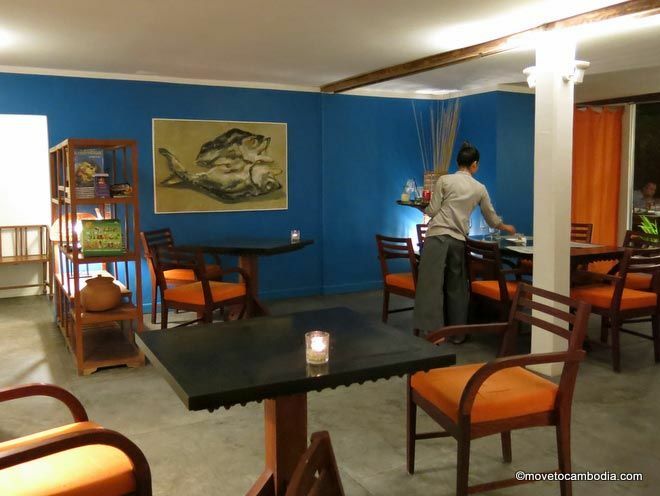 For slightly more upscale Khmer food, try Bopha Leak Khluon Restaurant. Their barbecued beef skewers are addictive, and the eggplant stuffed with pork and shrimp is divine. Study up on your Khmer before you go, though, they don’t have an English menu. If you’re in the mood for more Western fare, La Boulangerie offers French-style breakfasts and quiches at reasonable prices. Tigre de Papier may sound like an entirely French affair, but their chicken shawarma is delicious–the perfect hangover-buster. Along the river, Rosy Guesthouse offers a full menu of Western dishes, including a plump, juicy burger with caramelized onions and cheese. Served with homemade pickles, coleslaw and chips, budget some extra time to finish the heaping plate. 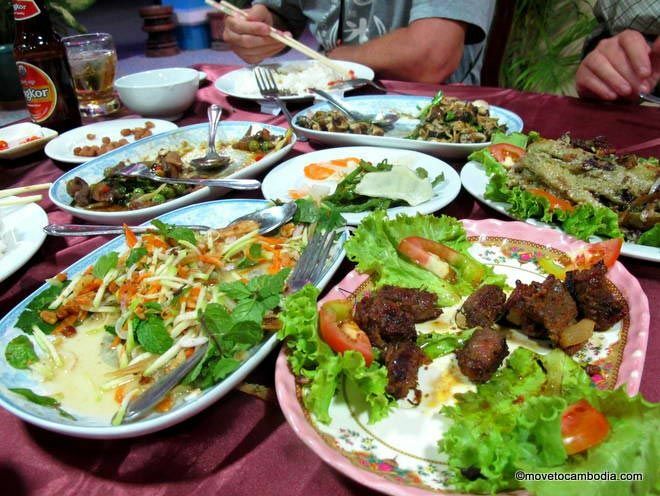 This entry was posted in Siem Reap, Food and tagged Rosy Guesthouse, Cuisine Wat Damnak, Il Forno Siem Reap, Abacus Siem Reap, Happy Restaurant Siem Reap, Dae Bak Siem Reap, Basho Siem Reap, Takezono, Chanrea Dom Makara, Bopha Leak Khluon Restaurant, La Boulangerie, Tigre de Papier, Siem Reap restaurants. Bookmark the permalink.